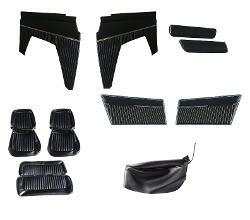 This complete interior trim kit is just what you need to update your worn or mis-matched interior. Each kit includes matching vinyl door panels, quarter panel inserts for hard top (soft top style available by request), seat covers, rear arm rest covers & sun visors. Door panels come solid but can be substituted for woodgrain or chrome mylar at no extra charge. If you don't see the color scheme you are looking for, call us for a quote on one of our many speacial order options. Special orders cost extra and take 6-10 weeks to process. MADE IN THE USA!! !